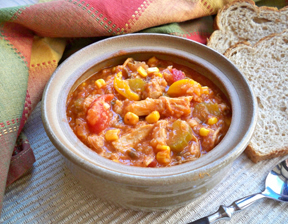 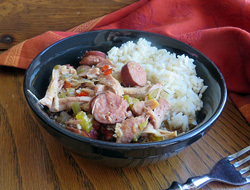 A thick, stew-like dish that is a specialty of Louisiana cooking. 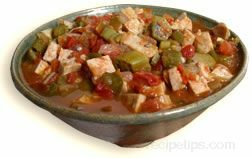 It can be made with a number of ingredients, such as tomatoes, okra, onions, herbs and spices, and one or more types of meat such as chicken, turkey, sausage, ham, shrimp, fish, or crab. 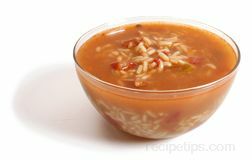 To begin the preparation of gumbo, a dark roux must be made, which is a blend of flour and butter cooked over low heat. 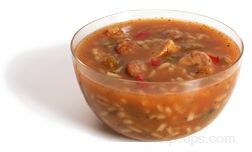 This enhances the flavor of the gumbo, giving it a rich taste and serves as a thickener for the remaining ingredients as they are added.